Users show Dashboard by using a key stroke, as specified in the Exposé & Spaces pane of System Preferences. By default, the key is F12. Alternatively, users can click the Dashboard icon in the Dock. When Dashboard runs, it overlays the windows currently visible on the desktop and displays the active widgets, as shown in Figure 1. Multiple widgets, including multiple instances of one widget, can exist in Dashboard at one time. 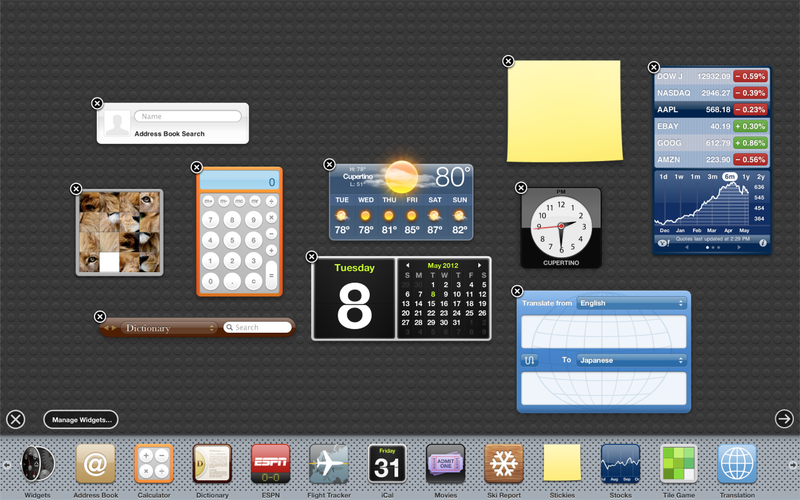 Users have complete control over what widgets are visible and can freely move them anywhere they please in Dashboard. The widgets appear when Dashboard is launched and disappear when Dashboard is dismissed. The Manage Widgets button and the Widgets widget, both of which open a list of all installed widgets and give users an easy way to download more widgets. A close button at the upper-left of each widget in Dashboard (shown in Figure 1), which allows users to remove the widget from Dashboard without deleting it. What Is a Dashboard Widget? A widget is a mini application that exists exclusively in Dashboard. From the user’s perspective, it behaves as an application should: it shows useful information or helps them perform a simple task with a minimum of input. For example, Weather (shown in Figure 2) displays a 6 day weather forecast for the location the user selects. Above all, widgets are small, lightweight, and narrowly focused on a single task. Users reveal Dashboard when they want to check on something or perform a quick, simple task while they are in the midst of using their desktop applications. For this reason, users expect widgets to be instantly available, quick to use, and easy to dismiss. As you create this widget, you become familiar with a widget's bundle structure, its information property list file, a basic style sheet, and the HTML file needed to make the widget function. You also learn how to put these pieces together and install the widget in the right place. All of the files needed to implement this widget are available in the Hello World sample project. Note: The sample code included in this article is simplified and may not conform to strict HTML specifications. Widgets are distributed as bundles. A bundle is a directory in the file system that groups related resources together in one place. A widget's bundle contains at least four files: an information property list file (Info.plist), an HTML file, and two PNG images. There may or may not be a fifth file that contains the style sheet for the widget. Note: Depending on the version of the sample code you get, you may or may not see the HelloWorld.css file included in the bundle. This is because later versions of the sample place the CSS content within the HTML file. Note: You should try to avoid using Flash in your widget because widgets function best when they are as lightweight as possible. These file extensions are not enforced by Dashboard, but it is recommended that you adhere to these standards. It is advisable to create a single HTML file for your widget. If a widget contains more than one HTML file, the resulting reloads can make your widget seem less like a mini application and more like a website. Each widget must have an information property list (Info.plist) file associated with it. This file provides Dashboard with information about your widget. Dashboard uses this information to set up a space in which it can operate. Required. A string that uniquely identifies the widget, in reverse domain format. Required. A string that contains the name of your widget. Must match the name of the widget bundle on disk, minus the .wdgt file extension. Required. 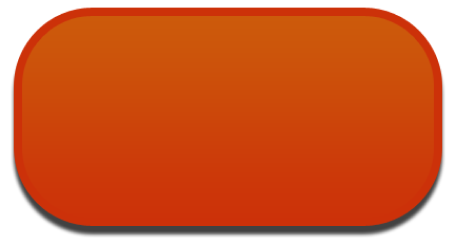 A string that contains the actual name of the widget, to be displayed in the widget bar and the Finder. Required. A string that gives the version number of the widget. Optional. An integer between 0 and 100 that sets the placement of the widget’s close box on the x-axis. Optional. An integer between 0 and 100 that sets the placement of the widget’s close box on the y-axis. Optional. A number that gives the height, in pixels, of your widget. If not specified, the height of Default.png is used. Required. A string that gives the name of the HTML file that implements your widget. Optional. A number that gives the width, in pixels, of your widget. If not specified, the width of Default.png is used. Of note are the values for the CloseBoxInsetX and CloseBoxInsetY keys. These values determine the placement of the close box of your widget. You should position the close box so that the "X" is centered over the top-left corner of the widget. Note that in this Info.plist file, the Width and Height keys are omitted. As previously mentioned, these keys are optional. Because they aren’t included, this widget is automatically sized based on the dimensions of its default image. There are more optional Info.plist keys than those described here; you can read about them in Dashboard Info.plist Keys. Of particular note are the access keys, which allow you to turn on access to external resources. Using Access Keys discusses these in more depth. Note: While an Info.plist file is just a text file, it's easiest to edit one using the Property List Editor application, located in /Developer/Applications/Utilities/ on your hard disk when you install the Xcode Tools. The two image files required in a widget are the icon and default image files. They need to be formatted as Portable Network Graphics (PNG) files and must be named Icon.png and Default.png, respectively. The default image, Default.png, is shown while your widget loads. It can be the background used by your widget or any other appropriate image. This file also sets the size of your widget if you don’t use the Height and Width properties in your Info.plist file. For more on widget bar icon sizes and other design elements, see Designing Widgets. 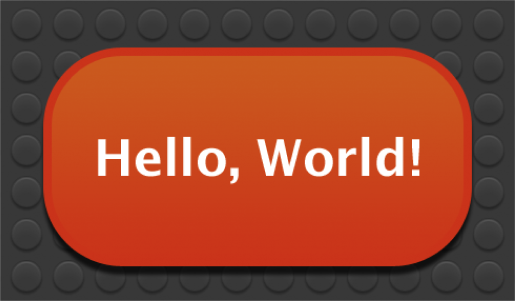 Note: When assembling your Hello World sample widget, make sure that the Icon.png and Default.png file names have their leading letter capitalized. 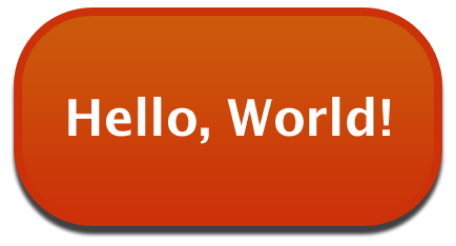 The style sheet defines the styles for the body and for an arbitrary span class called helloText. This class is applied to the "Hello, World!" 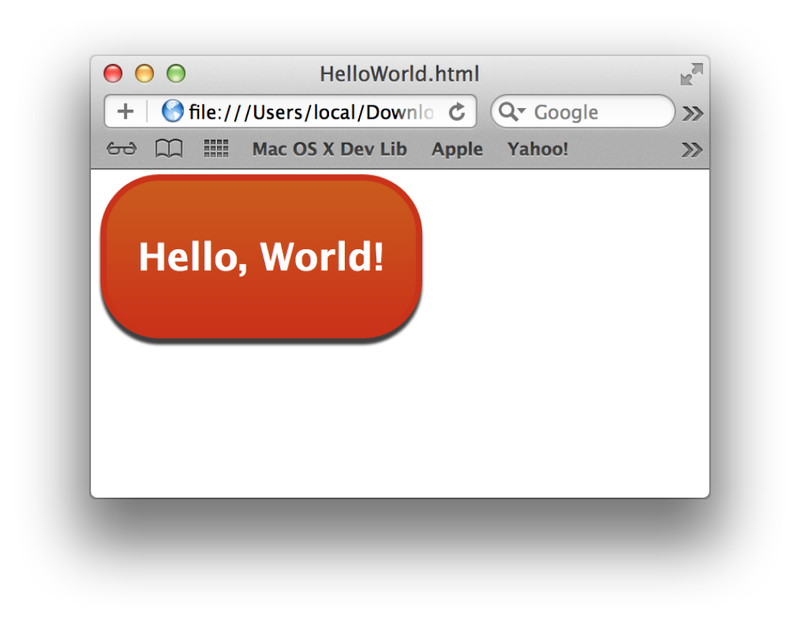 text in the HelloWorld.html file. Figure 6 shows what the code looks like when rendered in Safari. In fact, when testing your widget, you can open it in Safari and get the same appearance you would get if it were loaded into Dashboard. Now that you have completed the three basic components for the widget, you can assemble them into a bundle and load your widget into Dashboard. When the files are in place, rename the directory Hello World.wdgt. Note: Finder will ask you to confirm this action. Go ahead and choose Add and the bundle will be made for you. After the bundle has been renamed, double click its icon in the Finder to install it. This displays an install dialog that, when you click Install, copies the widget to ~/Library/Widgets/ and opens it in Dashboard. It should look like the view in Figure 7. Congratulations! You’ve just created your first Dashboard widget. Now you're ready to enhance your widget with some of the features Apple provides in Dashboard and WebKit. Begin by reading about the guidelines that govern great widgets in Designing Widgets. Then, read other articles in this document to learn about details that interest you, such as Using Animation or Accessing External Resources.